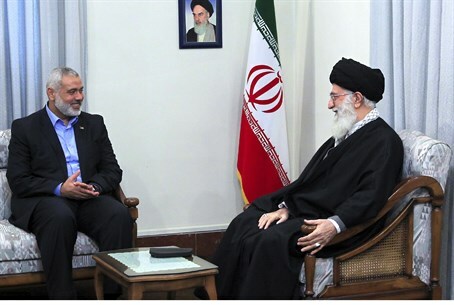 Official statement confirms ongoing ties between Hamas, Islamic Republic. Hamas has "resumed" relations with Iran after a temporary falling out over the Syrian conflict, according to AFP. "Relations between Hamas and Iran have resumed," senior official Mahmud al-Zahar told reporters at a Monday news conference in Gaza. Ties had been "affected by the Syria situation, and Hamas has withdrawn from Syria so that it can't be identified with this or that side," he said. "We've confirmed we are not interfering in the Syrian case, or in any other Arab country." Shia Iran had long supported the Sunni Hamas against Israel, which is viewed as a common enemy. But exiled Hamas chief Khaled Meshaal left his base in Damascus after the Syrian civil war broke out in 2011, criticizing President Bashar al-Assad, a key ally of Iran, and moving to the Sunni Gulf state of Qatar. But the Hamas leader made remarks in October of this year supporting the Assad regime and calling for an end in sectarian fighting at a Jerusalem conference. The move was subsequently slammed by powerful rebel group Army of Islam, who denounced Hamas's ties with the Assad ally and claimed that they were trying to restore funding to Gaza by exploiting their position on the conflict. Media reports indicate that the constant switching of sides has led to a huge decrease in Hamas's funding - especially from Iran. But Zahar denied there had been a complete severing of ties. "Our relations with Iran were not cut, and we don't wish to cut ties with any Arab countries either, even those that are fighting against us," he said. The latter reference was to Egypt, which has taken a hard line against the Islamist group since the military overthrow of president Mohammed Morsi in July. Hamas is an affiliate of Morsi's Muslim Brotherhood, which has been the target of a massive crackdown in Egypt in recent months that has seen hundreds of Morsi supporters killed and more than 2,000 arrested. Zahar said there was still cooperation with Egypt on getting supplies, including fuel, into the Gaza Strip, but "there is no political contact, because the current (Egyptian) regime is against it." Since July, Egypt's military has destroyed hundreds of tunnels used to bring crucial supplies, including fuel, into the blockaded Strip. It has also launched efforts to stop terror tunnels into Egypt and Israel and battled terror factions in the Sinai desert, angering Gaza officials. Having initially spoken out against Egypt's new military regime, Hamas has sought to avoid a further deterioration in relations with Cairo.